CMML is a form of leukaemia that is characterised by high numbers of white blood cells, called ‘monocytes’, in the blood and bone marrow. 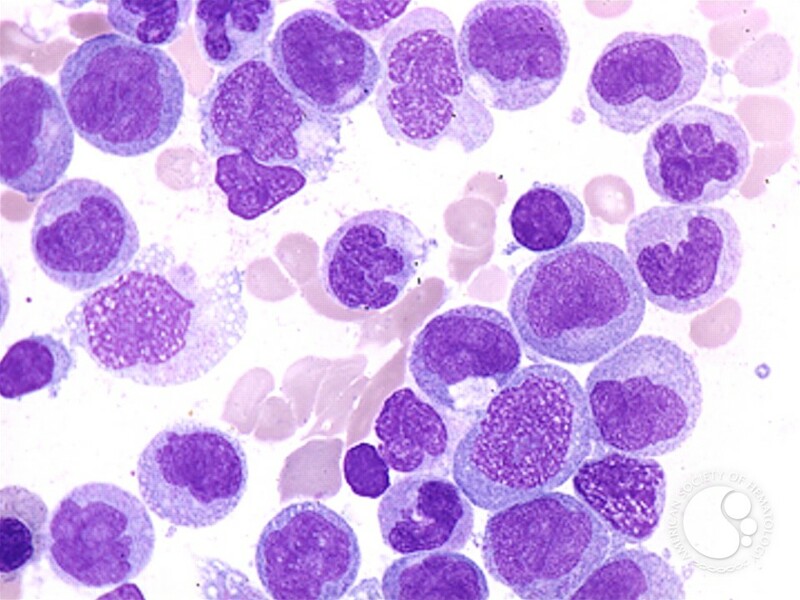 CMML is an uncommon blood cancer with features of two other types of blood cancer. Even though it has leukaemia as part of its name, the World Health Organisation (WHO) classifies CMML as a ‘mixed myelodysplastic (MDS) myeloproliferative neoplasm (MPN)’. MPN is a group of disorders of the bone marrow stem cells that produce excess numbers of one or more types of blood cells (red cells, white cells, or platelets). MDS is a group of diseases that affects, to a greater or lesser extent, the production of normal blood cells in the bone marrow. Around 50% of people diagnosed have a type of CMML with a high white cell count and resemble an MPN. The other 50% have a normal or reduced white cell count at diagnosis and the disease is more similar to a MDS. CMML is different to chronic myeloid leukaemia (CML). CML affects the myeloid cells in the blood and bone marrow, while CMML affects a specific myeloid cell called a monocyte, which helps to fight infections. chronic myelomonocytic leukaemia (CMML) is a rare type of blood cancer. In CMML there are too many monocytes in the blood. Monocytes are a type of white blood cell. CMML has similar features with two other types of blood disorders: myelodysplastic syndromes (MDS) and myeloproliferative neoplasms (MPN). However, CMML is a separate condition with different treatment options because people with CMML can have features of both MDS and MPN. CMML affects 2 in 100,000 people in Australia annually. CMML generally affects older adults who often go to their doctor with problems relating to anaemia (low red cell count), infection, bleeding, or an enlarged liver and/or spleen. Most people diagnosed are older than 70 years of age. CMML is more common in men than women. There have been cases reported in younger adults and older children, but this is a very small group. The most common sign of chronic myelomonocytic leukemia (CMML) is having too many monocytes (seen on a blood test). Having too many monocytes also causes many of the symptoms of CMML. These monocytes can settle in the spleen or liver, enlarging these organs. An enlarged spleen (called splenomegaly) can cause pain in the upper left part of the belly (abdomen). It can also cause people to notice they feel full too fast when they eat. If the liver gets too big (called hepatomegaly), it causes discomfort in the upper right part of the abdomen. A shortage of red blood cells (anemia) can lead to feeling very tired, with shortness of breath and pale skin. Not having enough normal white blood cells (leukopenia) can lead to frequent or severe infections. A shortage of blood platelets (thrombocytopenia) can lead to easy bruising and bleeding. Some people notice frequent or severe nosebleeds or bleeding from their gums. Other symptoms can include weight loss, fever, and loss of appetite. Of course, many of these problems are caused more often by something other than cancer. If you’re having symptoms, you should see a doctor so a cause can be found. We do not know the cause of CMML. We do know that some cases of CMML occur as a result of a gene mutation. Gene mutations known as TET 2 and RAS have been linked to CMML. Potentially, any incident that damages the genetic material of the body can cause a mutation that may lead to the development of CMML. We don’t know the cause of most cases of CMML but there are some risk factors that can increase your risk of developing it. A risk factor is something that might make you more likely to develop a particular condition or disease. Your risk of developing CMML increases with age. It most commonly develops after the age of 60. And it is more common in men than women. If you have had treatment for cancer you are at an increased risk of developing CMML. CMML is not infectious and cannot be transmitted from one person to another. A risk factor is anything that changes your chance of getting a disease such as cancer. Different cancers have different risk factors. For example, exposing skin to strong sunlight is a risk factor for skin cancer. Smoking is a risk factor for lung cancer and many other cancers. But people without any risk factors can still get the disease. And having a risk factor, or even several, does not mean that you will get the disease. Because chronic myelomonocytic leukemia (CMML) is rare, it has been hard to study. For a long time it was grouped with myelodysplastic syndromes. As a result, only a few risk factors are known for this disease. The risk of CMML increases with age. This disease is rare in those younger than 40, with most cases found in people 60 and older. CMML is about twice as common in men as in women. Prior treatment with chemotherapy seems to increase the risk of CMML. The risk of CMML after cancer chemotherapy, however, is not as high as the risk of other blood problems, such as myelodysplastic syndromes and acute myeloid leukemia. Second Cancers in Adults has more information on this. Bone marrow aspiration and biopsy to see how your bone monocytes in your bone marrow look (required for diagnosis). Cytogenetic testing looks at abnormalities in your cell DNA may also be done. There is no one standard treatment regimen for CMML. Treatment depends on factors including: the stage of the disease; a person’s age; the extent of symptoms; and general overall health. People with MDS-type CMML and MPN-type CMML usually are treated with the same or similar chemotherapy drugs to control the disease. CMML is often managed using the ‘watch and wait’ approach, with supportive care provided if and when required. “Watch and Wait” involves regular monitoring of blood and general health. No intervention is needed unless the person begins developing signs and symptoms of the disease, indicating it is progressing. Supportive care refers to the administration of therapies to alleviate symptoms of the disease or to manage the side-effects of the therapies. Supportive care is aimed at improving the person’s quality of life and may even extend the person’s life. This is often the only treatment suitable for older people, or those with other health problems, as they may be less able totolerate stronger treatments. The aim of supportive care is not to treat the disease but to alleviate symptoms such as shortness of breath, bruising or bleeding. Blood and platelet transfusions -Transfusing blood products may be required to alleviate symptoms and to improve overall health. Antibiotics – People who have a reduced immune system from CMML may be at an increased risk of developing severe infection. Antibiotics can prevent a simple infection becoming life threatening. Chemotherapy involves the use of chemicals. Chemotherapy drugs are also known as cytotoxic(cell toxic) as they kill cells, especially those that multiply quickly, like cancer cells. Chemotherapy can be given as a tablet, as an infusion into the vein, or as an injection under the skin. Recently, azacitidine has been used to treat CMML. For some people, a stem cell transplant is an option and is the only known cure for CMML. Unfortunately, due to the risks associated with a stem cell transplant, not everybody is eligible to have one. Your doctor will discuss treatment options with you and your loved ones and gain your consent prior to commencement. How do clinical trials help? Treatments are being revised regularly as new research becomes available. Research in the laboratory opens the possibility for clinical trials in the hospital setting. This may give a person access to new treatments before they are otherwise available and approved by the government. Clinical trials have specific criteria to ensure the safety of the person from the new treatment. This then helps to ensure credible results. Through clinical trials, people can help others by contributing to medical research and future treatments.